Leionema elatius is a member of the Rutaceae family in common with the native correas, croweas and exotic citrus and is known as the Tall Phebalium. The species was previously known as Phebalium elatius. A number of Phebaliums have been moved to this new genus. Leionema elatius is a small to medium shrub. Leaves are small, about two centimetres long and strongly aromatic when crushed. This is a characteristic of the genus. The upper surface is smooth, glossy and the midrib is prominent on the undersurface. 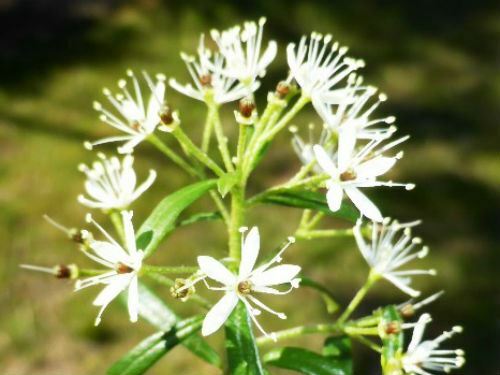 Flowers are white, about one centimetre across and held in terminal clusters. Blooms are profuse and conspicuous appearing in spring. A light pruning after flowering is beneficial. Leionema elatius occurs in north-eastern New South Wales and southern Queensland. The species is considered rare in nature. There are two subspecies L. elatius ssp elatius and L. elatius ssp beckleri. The illustrated specimen, from our cold climate garden, is the former sub species. This specimen is surviving, thriving and blooming bounteously in heavy shade.